Heat a 10-inch skillet over medium-high heat. Add the burgers and cook until well browned on both sides. Remove the burgers from the skillet. Pour off any fat. Stir the soup in the skillet and heat to a boil. Return the burgers to the skillet. Reduce the heat to low. Cover and cook for 5 minutes or until desired doneness. Top the burgers with the cheese and cook until the cheese is melted. Serve the burgers on the buns with the soup mixture for dipping. 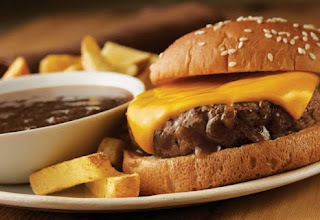 Tip: You can also serve these burgers in a bowl atop a mound of hot mashed potatoes, with some of the onion gravy poured over. Serving Suggestion: Serve with romaine salad tossed with fresh basil and Italian salad dressing. For dessert, serve orange slices.